Potassium oxide (K2O) or Kalium oxide is an ionic compound of potassium and oxygen. This pale yellow solid, the simplest oxide of potassium, is a rarely encountered, highly reactive compound. Some materials of commerce, such as fertilizers and cements, are assayed assuming the percent composition that would be equivalent to the chemical compound mixture K2O. Other possibility is to heat potassium peroxide at 500 °C which decomposes at that temperature giving pure potassium oxide and oxygen. Potassium hydroxide cannot be further dehydrated to the oxide but it can react with molten potassium to produce it, releasing hydrogen as a byproduct. K2O crystallises in the antifluorite structure. In this motif the positions of the anions and cations are reversed relative to their positions in CaF2, with potassium ions coordinated to 4 oxide ions and oxide ions coordinated to 8 potassium. K2O is a basic oxide and reacts with water violently to produce the caustic potassium hydroxide. It is deliquescent and will absorb water from the atmosphere, initiating this vigorous reaction. The chemical formula K2O (or simply 'K') is used in several industrial contexts: the N-P-K numbers for fertilizers, in cement formulas, and in glassmaking formulas. Potassium oxide is often not used directly in these products, but the amount of potassium is reported in terms of the K2O equivalent for whatever type of potash was used, such as potassium carbonate. For example, potassium oxide is about 83% potassium by weight, while potassium chloride is only 52%. Potassium chloride provides less potassium than an equal amount of potassium oxide. Thus, if a fertilizer is 30% potassium chloride by weight, its standard potassium rating, based on potassium oxide, would be only 18.8%. ^ a b c Lide, David R., ed. (2009). CRC Handbook of Chemistry and Physics (90th ed.). Boca Raton, Florida: CRC Press. ISBN 978-1-4200-9084-0. ^ a b c Wyckoff, Ralph W.G. (1935). The Structure of Crystals. American Chemical Society (2nd ed.). Reinhold Publishing Corp. p. 25. 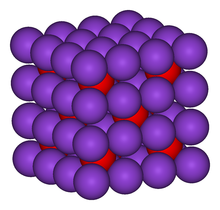 Wikimedia Commons has media related to Potassium oxide.